A woman had "no love in her eyes" for the daughter she is accused of murdering, a court has heard. Nadia Ahmed, 44, made the claim on her second day of evidence at the trial of her sister-in-law, Sadia Ahmed. 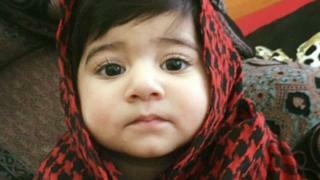 The 28-year-old denies murdering 14-month-old Inaya at the family home in Glasgow on 17 April last year. At the High Court in Glasgow, Nadia Ahmed claimed her sister-in-law had confessed to killing the child a few days after she died. It is alleged Sadia Ahmed killed Inaya by placing a pillow over her face or shaking her by the body. The child was on a life support machine for three days before she died. Prosecutor Paul Kearney asked the witness if she had concerns about how Sadia Ahmed cared for her daughter. She said: "I was concerned and I had told my mum that in Sadia's eyes I never saw any love for Inaya. She did not look after her." Nadia Ahmed told the court that days after the child's life-support machine was switched off, her sister-in-law told her that she had put a pillow over Inaya's face. "She was completely normal, it seemed as if it was nothing to her. I felt as if everything had stopped. Everything had frozen. I was wondering if my ears were hearing the right words." Nadia Ahmed told the court that in June this year, during Ramadan, Sadia Ahmed phoned her to ask for forgiveness. She said she told the murder accused: "I forgive you for the sake of Allah." The witness told the jury that Sadia Ahmed then asked why she had given a statement to the police. Ms Ahmed was asked about her initial police statement in which she said she did not have any concerns about how her sister-in-law treated Inaya and how she fed her. Ms Ahmed also initially told police that Inaya choked on food. When asked about this Ms Ahmed said: "My first police statement was a lie, but I'm telling the truth today."